LONDON, UK (Wednesday, January 25, 2016): Throughout 2016 IDEAS+CARS and our partner team eSPORTS+CARS have been tracking the growth of eSports and providing insight to our partners. 2017 was always going to see huge growth, but even the impact and volume of news that has come out in the first 25 days of January is quite remarkable. Big brands had been making various moves to eSports over the past 18 months with the pioneers hoovering up rights and partnerships. Now we are starting to see the mainstream is rushing to catch up. Audi recently pulled out hundreds of millions of Euros of investment from the 24 Hours of Le Mans and the FIA World Endurance Championship. One of its next moves has been to invest in an eSPORTS team. “Audi dabbled in gaming when it sponsored a ‘24 Hours of Le Forza’ live stream event in June. But this partnership marks the company’s first big investment in eSports, an industry that has seen a surge of mainstream attention in the last year. “It is a very interesting area with huge and strong demographics,” said Christian Weiglin Thorn, Head of Marketing at Audi. 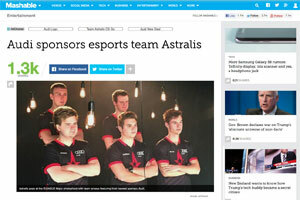 Recent upheaval in F1 has meant that many personalities are running towards the gaming bandwagon. The Team Principal of the Red Bull backed Torro Rosso has been widely quoted as wanting gaming activity at F1 races. Despite his awkward use of the terminology, his thoughts are clear on the benefits. “Why not have Sunday morning an eGame with a big broadcast where people worldwide are involved to increase the interest?” said Toro Rosso team principal Franz Tost. 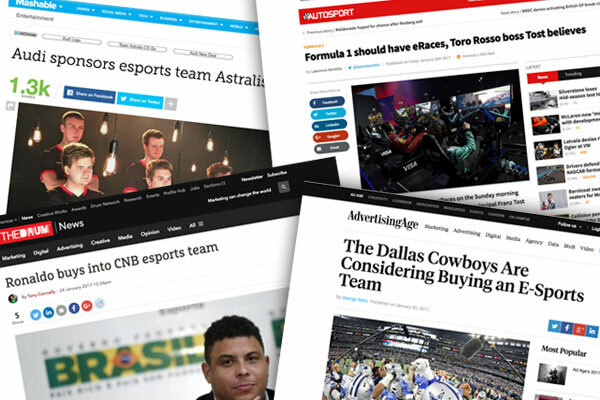 And the rush of sports entities and personalities investing in eSports continues with news from the Dallas Cowboys and Ronaldo. Coverage is now leaking into traditional marketing sites such as Ad Age and The Drum. In their Ronaldo coverage The Drum points out the obvious about eSports to it’s under informed audience. 2017 is going to be big for eSports – the question is now only how big and who will not be involved in 12 months time.